As well as our refreshing spring water from our source in Glastonbury, we appreciate different water solutions work better in different environments. Only 15% of our production is one time use plastic, which we are also delighted to say will be RPET (recycled PET) in the very near future. Our bottled water cooler bottles are reused many times & we have been offering plumbed in water coolers from the start. The addition of plumbed in bottling systems adds another green solution to our portfolio & most importantly allows the consumer to choose the correct solution for them. The systems themselves come in a variety of shapes & sizes & can be used with cups, carafes & bottles. The reusable carafes & bottles can be plain or branded & cleaned in a dishwasher. We currently have 3 systems but will soon be adding more: The Borg & Overstrom u1 for the small to medium user. 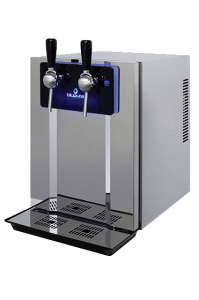 The Blubar also for medium users but specifically tailored for cafes, bars & restaurants, & the Borg & Overstrom u2 for the larger user & Horeca environment. As well as each system catering for a specific area they each have their own unique variations. 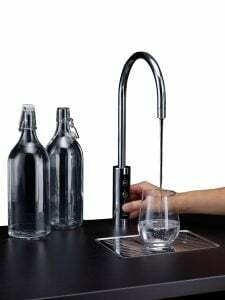 Finally we have the Versafiller a solution ideally placed in more public areas where there is a need to refill bottles, where high usage combined with hygiene is paramount. The unit can be recessed into a wall or can sit on top of a water fountain (pictured) to give a complete solution, this combination also allows disabled & child access at a lower height. 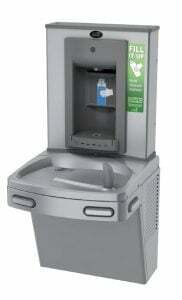 Hands free activation ensures cleanliness at all times & a bottle counter shows how many times you have refilled. Ideal for schools, colleges, shopping centres, gyms & airports. If you have a water requirement we probably have the solution, and if we don’t .. we can probably source it.